Everyone understands that dimming simply means reducing the amount of light emitted from a light fixture (luminaire). However, the manner in which the light level is reduced and how it is perceived by the viewer is often misunderstood. The human eye does not perceive changes in light level in a linear manner and slight variations in perception occur between individuals. However, instruments measuring photometric quantities such as lumens, footcandles and lux measure light in a perfectly linear manner as is required for precision comparison of light sources. 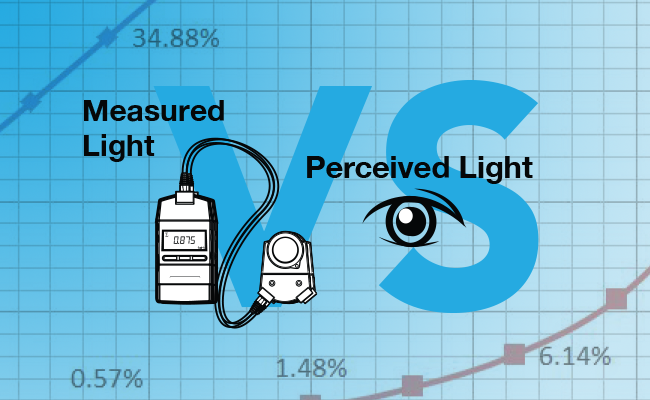 If the light level is dimmed to a level of 50% as measured by an instrument, the human eye does not perceive this light level to be 50% of the original level. In simple terms, half of the measured brightness does not appear to the viewer as half as bright. Human factors studies have shown that the eye perceives light in a logarithmic manner, mathematically speaking, in an approximately squared power relationship. Figure 1 illustrates this relationship. If the measured light level is 10% of the maximum light level then the perceived light level is √0.10 = 0.316 or 31.6% of the maximum light level. So, the viewer interprets the light level is dimmed to about 32% of the maximum level whereas the measured level is 10%. Please keep in mind that all luminaire manufacturers specify dimming levels as the measured dimming percentage. the dimming control is set to 50% or at 50% of its slider range then the measured light level is at 50%. However, with a linear profile the changes in light level at the low end of the dimming range are quite large and are sometimes viewed as step changes instead of smooth changes. This is due to the fact that the eye response is logarithmic and these step changes are perceived as being even larger than the measured percentages are. That being said, linear dimming profiles are adequate for many lighting applications that simply require dimming to be used for adjusting the light level for various tasks and times of day. In these applications the light level is adjusted occasionally and left at this level for a long period of time. These applications actually comprise a majority of dimming requirements. The best simulation of the eye response is achieved with a logarithmic dimming profile. Figure 1 shows the typical eye response curve but slightly different logarithmic profiles are used by various LED driver manufacturers to enhance dimming performance. In addition to mimicking the eye response better, a logarithmic dimming profile enhances dimming smoothness at the lowest dimming levels. With the advent of the latest LED drivers that can achieve dimming to levels of nearly 0%, the availability of a logarithmic profile becomes even more important. Logarithmic profiles are also valuable for high-lumen-output luminaires (5000 lumens and above) in that they enable the dimming performance to be smoother because of the inherently wide lumen range of the light fixture. Applications requiring artistically ulta-smooth dimming such as theaters will greatly benefit from using logarithmic dimming profiles in all lumen ranges. To illustrate the dramatic difference between a linear and logarithmic dimming profile, Figure 2 shows the measured light levels resulting from the same Pathway Lighting luminaire utilizing both linear and logarithmic profile dimming drivers. The data in this curve is actual data measured at Pathway Lighting with their in-house integrating sphere and goniometer. Note that the logarithmic profile in this curve is more extreme than the typical eye response shown in Figure 1. This type of profile is commonly used by many LED driver manufacturers in that it further enhances low level dimming smoothness and adjustability. Other physiological factors such as pupil dilation, eye adaptation and eye saturation at high light levels contribute to make this type of logarithmic profile especially useful for lighting applications. As a matter of fact, the DALI dimming profile specified in international standard IEC 62386 closely follows this type of logarithmic profile. Don’t let the technical discussion you’ve just read worry you about making the wrong dimming selection. There are no wrong choices, just some that are more advantageous for certain applications than others. Pathway Lighting wants to be able to provide you with the most complete selection of dimming options in the industry. With today’s advances in LED driver electronics, dimming to a level of 1% is becoming the standard while some drivers are capable of dimming to virtually 0%. The 10% low-level dimming restriction found in the industry previously is fast becoming obsolete. The advent of programmable drivers has enabled Pathway Lighting to offer a wide variety of dimming options, including different dimming profiles. For most applications that simply require dimming to be used for adjusting the light level for various tasks and times of the day, a linear dimming profile will suffice. For critical, artistic applications that require ultra-smooth dimming and for high-lumen-output luminaires, a logarithmic profile is recommended. Another consideration is matching dimming profiles of all fixtures used in a single space. If fixtures of varying lumen outputs are used in a single space, it is advantageous to have all luminaires utilize a linear or logarithmic profile for consistency in dimming performance. If in doubt, please contact your Pathway Lighting Sales Specialist for recommendations for your particular application.